Abstract. Numerous mouse models of polycystic kidney disease (PKD) have been described in which the mutant phenotypes closely resemble human PKD with regard to morphology, cyst localization, and disease progression. As in human PKD, genetic background affects the disease phenotype in mouse PKD models. Using experimental crosses, these modifying effects can be dissected into discrete genetic factors referred to as quantitative trait loci. The locus for the mouse bpk model was recently mapped to chromosome (Chr) 10. In the course of these studies, marked variability was observed in the renal cystic disease expressed in F2 bpk/bpk homozygotes of a (BALB/c-+/bpk × CAST/Ei)F1 intercross. The current study was undertaken to further characterize the renal cystic disease as quantitative trait in this F2 cohort and to map the genetic modifiers that modulate this phenotype. Whole-genome scans revealed a CAST-derived locus on distal Chr 6, near D6Mit14, that affects renal cystic disease severity. Additional analyses identified loci on Chr 1, Chr 2, and Chr 4, as well as a possible interaction between the Chr 6 locus and a locus on distal Chr 1, near D1Mit17. Interestingly, the gene encoding RGS7, a regulator of G protein signaling that binds to polycystin-1, was mapped to the same Chr 1 interval. It is concluded that the severity of the bpk renal cystic disease phenotype is modulated by multiple loci and possibly by epistatic interaction among them. It is hypothesized that the gene encoding the polycystin-binding partner RGS7 is a candidate for the Chr 1 genetic modifier. Renal cystic disease characterizes several human single-gene disorders, including : (1) autosomal dominant polycystic kidney disease (ADPKD) ; (2) autosomal recessive polycystic kidney disease (ARPKD) ; (3) juvenile nephronophthisis-medullary cystic disease complex (JN-MCD) ; and (4) several multiple malformation syndromes (1, 2). The principal genes involved in ADPKD (PKD1 and PKD2), JN (NPHP1), TSC (TSC1 and TSC2), and VHL (VHL) have been identified (reviewed in references (1) and (2). In addition, the predominant ARPKD locus (PKHD1) has been mapped (3, 4). Some of these disease genes interact, either directly at the protein level or in disease pathogenesis (5,6,7). These data suggest that common molecular pathways may be involved in the pathogenesis of human renal cystic disease. For PKD, the biologic complexity of these pathogenic pathways is suggested by the presence of interfamilial as well intrafamilial variability in disease phenotypes (8,9,10,11,12,13,14). The mechanisms underlying this broad phenotypic variability include : (1) mutations in different disease genes ; (2) different mutations within the same disease gene ; (3) random somatic mutations in the wild-type allele, e.g., in ADPKD ; and (4) genetic modifiers and/or environmental factors that modulate the expression of specific disease genes. Among these various mechanisms, the identification of modifier genes that affect these single-gene traits may offer particularly revealing insights about molecular pathogenesis of PKD. However, the characterization of these putative modifying genes would be quite difficult in the complex, randomly mating human population. In comparison, complex genetic interactions can be probed in mouse models far more easily than is possible in human families. As summarized in Table 1, numerous mouse models of PKD have been described in which the mutant phenotypes closely resemble human PKD with regard to morphology, cyst localization, and disease progression (15). As in human PKD, genetic background affects the disease phenotype in most of these mouse PKD models. Using experimental crosses, these modifying effects can be dissected into discrete genetic factors referred to as quantitative trait loci (QTL) (16). Recently, QTL have been mapped to chromosome (Chr) 1 and Chr 10 for jck (17), Chr 1 and Chr 19 for kat2J (18), Chr 4 and Chr 16 for pcy (19), and Chr 4 for cpk (20). Therefore, in a pattern analogous to human disease, multiple genes appear to be involved in renal cystogenesis in the mouse. Of the mouse PKD models, the bpk phenotype is very similar to human ARPKD. The bpk mutation (for BALB/c polycystic kidneys) arose spontaneously on the BALB/c inbred background and is transmitted as a fully penetrant, recessive trait (21). Similar to human ARPKD, affected bpk/bpk homozygotes develop both cystic dilation of the renal collecting ducts and biliary dysgenesis. Death ensues within 4 wk of birth, presumably due to renal insufficiency. We have mapped the bpk locus to mouse Chr 10 using F2 animals generated from an intersubspecific intercross between BALB/c-+/bpk and CAST/Ei and observed marked variability in the renal cystic disease expressed in F2 bpk/bpk homozygotes. In a somewhat surprising result, complementation testing indicated that bpk was allelic with jcpk, a PKD mutation more phenotypically similar to ADPKD (22). Moreover, the map position of the bpk locus colocalizes with the Chr 10 modifier for jck, yet another phenotypically distinct PKD mutation. Based on these data, we speculate that although there is a wide range of PKD phenotypes in the mouse, disease pathogenesis may involve a common subset of genes or genetic pathways. Elucidation of these genes and their molecular interactions should provide novel insights into the complex pathogenesis of PKD in the mouse, and given the phenotypic parallels, the pathogenesis of human PKD as well. The aims of the present study were : (1) to analyze the bpk phenotype in our F2 intercross progeny as a quantitative trait and identify putative QTL that are associated with disease severity ; and (2) to determine whether any of the other mouse PKD mutations or their putative QTL are candidate modifier loci for the bpk mutation. The bpk mutation arose spontaneously in the BALB/c inbred strain and has been transmitted as a stable, fully penetrant, recessive trait for more than 40 intercrossed generations (21). Using F2 animals generated from an intersubspecific intercross between BALB/c-+/bpk and CAST/Ei, we have previously mapped the bpk locus to a <1.0-cM interval between D10Mit115 and D10Mit173 on Chr 10. For the present studies, F1 progeny heterozygous for the bpk mutation were identified by test crossing and intercrossed to generate F2 mutants. All phenotypic mutants were homozygous for BALB/c alleles at both D10Mit115 and D10Mit173. Initially, offspring affected with cystic kidney disease died between 14 and 21 d after birth. Therefore, subsequent F2 litters were sacrificed 14 d after birth (range, 12 to 16 d). Those F2 pups sacrificed at <12 or >16 d of age were excluded from these analyses. To assess the severity of the renal cystic disease, we initially analyzed kidney weight alone, kidney weight as a function of body weight, and kidney length alone as well as the kidney length as a fraction of crown-rump length (K/C-R ratio). Among these parameters, the K/C-R ratio was the most convenient and reproducible index of disease severity. For all F2 progeny, gross renal abnormalities were confirmed by histopathologic analysis. Genomic DNA was prepared from spleens according to standard protocols. Microsatellite markers whose BALB/c and CAST/Ei alleles differed in size by at least 10 bp (bp) and which were spaced at approximately 25-cM intervals along each chromosome were chosen from the Whitehead/MIT Genome Database (http : //www-genome.wi.mit.edu). PCR primer pairs for these markers were purchased from Research Genetics (Huntsville, AL). PCR was performed and the products were analyzed on polyacrylamide gels as described previously (22). An initial genome scan was performed on cohorts of mice from the 15% tails of the K/C-R distribution (see Figure 2A). Suggestive evidence for linkage was detected with several loci, and the entire F2 cohort was typed for these loci. A second genome scan was performed using this additional genotype information (see Figure 2B). Genome scans were carried out by marker regression. Marker genotypes were encoded as two indicator variables, one for each of the parental genotypes, and an F statistic with 2 degrees of freedom (2 df) was calculated at each marker. Significance of the F statistics was assessed by permutation testing (23, 24). This approach allowed us to correct for the multiple testing that occurs in the genome scan. 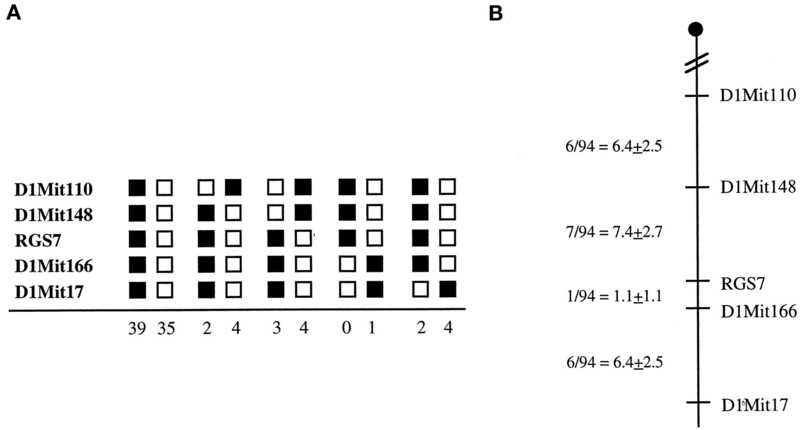 Significance thresholds, based on 1000 permutations of the original data, are indicated in Figure 2. Whole-genome scans for main effects on kidney disease severity measured as the quantitative trait, K/C-R in F2 bpk/bpk pups. (A) Whole-genome scan performed on the F2 mice at the 15% tails of the K/C-R distribution. (B) Whole-genome scan performed with using all F2 mice with additional genotype information on selected markers. Horizontal lines indicate 0.1, 0.05, and 0.01 critical values obtained by permutation testing. As an alternative approach to identifying multiple genes underlying this putative polygenic trait, we performed a forward stepwise regression procedure (25). All markers with complete genotype information, 18 in all, were eligible for entry in a multiple regression model for the trait K/C-R. Visual inspection of the genotype class means suggested that there were no overdominant effects among these loci (data not shown). Thus, we restricted our forward search to models with additive, dominant, and recessive effects. The regression F statistic for each of these models has one degree of freedom (1 df), reflecting the restricted genetic model. The best term was added sequentially to the multiple regression model until the next best term failed to achieve the nominal 5% significance level. In addition, we examined all possible pairwise interactions among these 18 loci. Our previous work provided preliminary evidence that the bpk locus may play several roles in PKD pathogenesis. Mutant alleles cause PKD in the phenotypically distinct bpk and jcpk models, whereas wild-type DBA/2J-derived alleles may act as a genetic modifier in the jck mouse model (22). By extension, we reasoned that the search for candidate QTL in all mouse PKD models should be informed by the map positions of other mouse PKD loci as well their binding partners. To that end, we sought to determine the map position of the gene encoding RGS7, a newly identified, short-lived regulator of G protein signaling that interacts with the C-terminal domain of the Pkdl gene product polycystin (26). We designed primers from the 3′ untranslated region of the RGS7 cDNA (GenBank accession no. AF011360) to identify a suitable PCR-typable polymorphism for mapping. PCR reactions were performed on 94 progeny of a (C57BL/6J × SPRET/Ei)F1 × SPRET/Ei backcross from the BSS Backcross DNA Mapping Panel (The Jackson Laboratory, Bar Harbor, ME) (27). The products were subjected to single-strand conformation polymorphism analysis (SSCA) and scored for the presence or absence of C57BL/6J alleles. Of the 758 F2 progeny generated, 182 (23.6%) had recessive PKD, as would be expected for the Mendelian inheritance of a single recessive trait. Thirty-nine of the 182 F2 pups were excluded from these studies due to age at death being either <12 or >16 d. Pathologic inspection of the remaining 143 F2 affected pups (mean age 14 ± 2 d) revealed markedly enlarged kidneys with a cystic pattern reminiscent of BALB/c-bpk/bpk mice at 24 to 28 d of age (data not shown). In the F2 population, the severity of the kidney disease, as assessed by K/C-R, was normally distributed (Figure 1) and more variable than in BALB/c-bpk/bpk mice. The phenotypic mean (K/C-R ± SD) in the 143 F2 bpk/bpk pups (0.42 ± 0.04) was similar to that in a cohort of 20 BALB/c-bpk/bpk pups (0.36 ± 0.01). An F test of these variances confirmed that they are statistically different (P < 0.001) (data not shown). 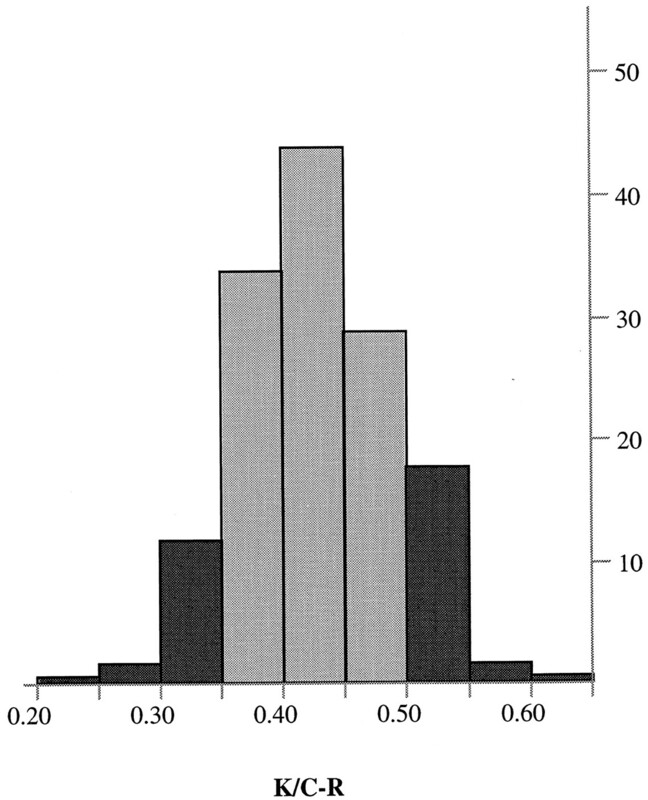 The frequency distribution of kidney length as a function of crown-rump length (K/C-R) in F2 bpk/bpk pups. The 15% most severely affected pups (21 of 143 ; K/C-R > 0.5) and the 15% least severely affected pups (22 of 143 ; K/C-R < 0.35) are identified by the darker shading. We hypothesized that the variable phenotypic severity in the F2 cohort was due to variation in the genetic background, particularly involving modifier loci whose alleles differed between BALB/c and CAST/Ei. To map these modifier loci, we used the ratio K/C-R as the quantitative trait and performed a whole-genome scan with markers spaced at approximately 25 cM. For the initial analyses, we selected the 15% most severely affected pups (21 of 143 ; K/C-R > 0.5) and the 15% least severely affected pups (22 of 143 ; K/C-R < 0.35) (Figure 1). The initial genome scan suggested the presence of putative QTL on Chr 1, Chr 2, Chr 4, Chr 6, Chr 8, Chr 11, and Chr 13 (Figure 2A). However, none of these loci achieved stringent genome-wide significance levels. We then extended our data by genotyping the entire cohort with markers from these putative QTL intervals. Using this extended data set, we identified a locus on distal Chr 6 that is highly significant, with the genome-wide P < 0.01 (Figure 2B), based on permutation testing (23, 24). This locus, near D6Mit14, appears to harbor recessively acting CAST alleles associated with severe renal cystic disease. Given the possibility that multiple loci may be acting together to influence disease severity, we performed multiple regression analyses using the fully genotyped markers. A forward stepwise search for main effects on kidney length was performed as described in Materials and Methods. 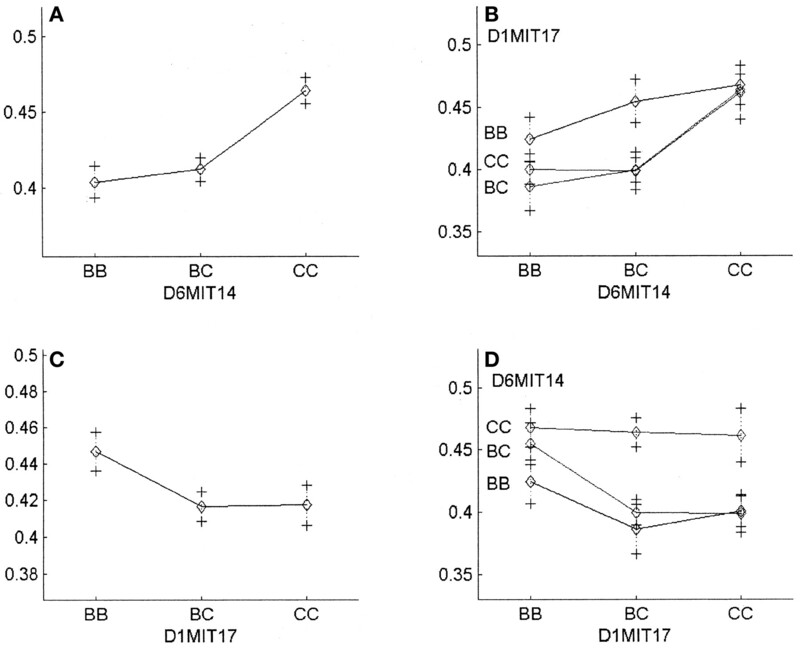 As shown in Table 2, this approach identified significant main effects associated with the markers D6Mit14, D1Mit17, D4Mit316, and D2Mit72. The stepwise search was terminated at the next step because none of the remaining loci achieved the 5% critical level. From these analyses, we conclude that there is a significant QTL on Chr 6 and suggestive QTL on Chr 1, Chr 4, and Chr 2. Together, these four loci explain 28.5% of the phenotypic variance in our F2 cohort, whereas the Chr 6 locus alone accounts for 15% of this variance. A large portion of the variability in this quantitative trait therefore remains unexplained. Finally, we searched for epistatic interactions by analyzing pairwise combinations of all markers with at least suggestive main effects. These analyses suggested a possible interaction between the locus on distal Chr 6 and a locus on distal Chr 1, near D1Mit17 (Figure 3). However, the effect [F(1,143) = 2.0 P = 0.16] did not reach genome-wide significance. Main effects and pairwise interactions for kidney disease severity in F2 bpk/bpk pups. The mean value of K/C-R is shown for each allelic combination of one or two loci as indicated. BB denotes homozygosity for BALB/c alleles and CC denotes homozygosity for CAST/Ei alleles. Approximate 95% confidence intervals (mean ± 2 SEM) for each of the pairwise genotype groups are shown. (B) The effect of the chromosome (Chr) 6 locus appears to be enhanced and is more distinctly dominant when there is at least one CAST allele present at the Chr 1 locus. (D) An alternative view of the same interaction. The Chr 1 locus has very little effect on the trait when the Chr 6 locus is homozygous for CAST alleles. However, when at least one BALB allele is present at the Chr 6 locus, the effect of the Chr 1 locus is distinctly recessive BALB. We have mapped the gene encoding RGS7, a regulator of G protein signaling that binds to polycystin-1, to distal Chr 1 interval. Using the primers RGS7-F1 (5′-ggagccaaggacgttagaccaaga-3′) and RGS7-R1 (5′-cacgaggagagagggaagcagac3′), a 151-bp PCR product polymorphism was detected between C57BL/6J and SPRET/Ei genomic DNA by SSCA. PCR reactions were performed using the BSS Backcross DNA Mapping Panel reagents as described in Materials and Methods. The products were subjected to SSCA and scored for the presence or absence of C57BL/6J alleles. Segregation of the alleles was compared with other loci in the BSS Backcross DNA Mapping Panel, and the RGS7 locus was positioned on Chr 1, between D1Mit148 and D1Mit17 (Figure 4). (A) Genotype data on mouse Chr 1 with a (C57BL/6J × SPRET/Ei)F1 × SPRET/Ei backcross and single-strand conformation polymorphism analysis. Black boxes represent the C57BL/6J alleles, and white boxes represent the SPRET/Ei alleles. The number of chromosomes for each haplotype is shown below the columns. (B) The linkage map of mouse Chr 1 illustrating the position of RGS7 in relationship to several loci previously mapped on the BSS DNA Mapping Panel. The recombination frequencies with the standard error are presented in centiMorgans to the left of the figure. While mapping the mouse bpk locus, we observed marked variability in the renal cystic disease among F2 bpk/bpk homozygotes of a (BALB/c × CAST/Ei)F1 intercross. The current study was undertaken to further characterize the renal cystic disease as quantitative trait in this F2 cohort and to map the genetic modifiers that modulate this phenotype. Given that the cystic phenotype was more severe in F2 bpk/bpk homozygotes than in those derived from the BALB/c parental strain, we speculated that either : (1) the putative QTL expressed alleles from CAST/Ei strain or (2) there was an epistatic interaction between CAST/Ei-derived and BALB/c-derived alleles of different modifying loci. The probability of detecting a QTL depends on the statistical threshold set for significance, the strength of the QTL, and the number of progeny in the cohort (28). Manley and Olson have defined the QTL strength in terms of the fraction of the total trait variance that the QTL explains (29). Those that explain more than 20% of the variance are considered strong QTL and these can be detected with power greater than 80% even in data sets with as few as 50 progeny. In comparison, weak QTL explain less than 1% of the trait variance and require at least 1000 progeny for detection at high power. Such experimental crosses are not routinely feasible. Finally, moderate QTL account for up to 20% of the trait variance and can be detected in crosses of reasonable size, e.g., 100 to 300 pups (29). In our cohort of 143 F2 pups, the forward stepwise search identified a significant main effect associated with the distal Chr 6 marker, D6Mit14. The F statistic for this marker, assuming a recessive mode of inheritance (1 df), is comparable to a lod score of 5.5, and thus exceeds the significance threshold of lod 3.4 suggested by Lander and Kruglyak (30). This modifier accounts for 15% of the trait variance, indicating that this QTL has moderate strength. In addition, our analyses provided suggestive evidence for QTL on Chr 1, Chr 4, and Chr 2. We note that some of these putative QTL-containing intervals have been identified in other mouse PKD models. In an experimental (C57BL/6J-+/jck × DBA/2J)F1 intercross, a QTL with recessively inherited C57BL/6J alleles was mapped to distal Chr 1 (17), whereas a QTL with recessively inherited CAST alleles was mapped to proximal Chr 4 in a (DBA/2J-+/pcy × CAST)F1 intercross (19). The three mouse models, bpk, jck, and pcy, are phenotypically quite distinct. If further investigation confirms that the same modifier loci modulate the PKD phenotype in these diverse models, it would suggest that mouse PKD genes and their genetic modifiers may operate in common molecular pathways. Disruption of any gene in these pathways could cause renal cyst formation, and disease severity could in turn be modulated by the inheritance of specific alleles at the other loci. We also extended our single locus analysis and tested for the presence of epistatic interactions among pairs of QTL that had at least suggestive main effects, e.g., loci on Chr 1, Chr 2, Chr 4, Chr 6, Chr 8, Chr 11, and Chr 13. We found evidence for a possible epistatic interaction between the Chr 6 QTL and the locus near D1Mit17, but the effect did not reach statistical significance. The power to detect an interaction with a small sample size is limited. We want to call attention to this particular interaction because of its form. As shown in Figure 3B, the effect of the Chr 6 locus appears to be enhanced and is more distinctly dominant when there is at least one CAST allele present at the Chr 1 locus. Figure 3D provides an alternative view of the same interaction, as the Chr 1 locus has little effect on the trait when the Chr 6 locus is homozygous for CAST alleles. When at least one BALB allele is present at the Chr 6 locus, the effect of the Chr 1 locus is distinctly recessive BALB. This observation has practical implications for the construction of congenic or consomic strains, which will be developed to prove the effects and the interaction at these loci. Furthermore, the interaction is epistatic in the classical genetic sense (31). The homozygous CAST genotype on Chr 6 masks the effect of the Chr 1 locus. An epistatic interaction of this type suggests that loss-of-function alleles (BALB at D1Mit17 and CAST at D6Mit14) may be disrupting a sequential pathway. This hypothesis is amenable to epistasis analysis (32), using crosses between congenic constructs. Finally, we reviewed the available databases to identify biologically relevant candidates that map to the putative QTL intervals. No such candidate genes were identified for the Chr 6 QTL. There are, however, attractive candidates that map to the putative QTL intervals on Chr 1 and Chr 4. Notable among these is RGS7, the polycystin-1 binding partner that we have mapped to distal Chr 1. The genes encoding the β-3 laminin chain, a component of laminin-5, one of the major constituents of the epithelial extracellular matrix (33), and transforming growth factor β-2, a fibrogenic cytokine (34), also map to this same Chr 1 region. In addition, we have recently mapped the wpk locus, a new rat model of ARPKD, to a region of rat Chr 5 that shares homology with the proximal mouse Chr 4 interval (35). Given the biologic function of these genes, each is an attractive candidate for the putative QTL in these intervals. However, we recognize that the QTL intervals defined in such two-generation crosses are rather broad and thus may encompass hundreds or even thousands of genes. Construction and analysis of consomic and congenic lines will be required to refine the putative QTL intervals and determine whether these candidate genes continue to cosegregate with the quantitative trait. In summary, no strong QTL were detected in our data set. One moderate QTL on Chr 6 exceeded the significance thresholds established by permutation testing in our data set, as well as empirically by large deviation theory (30). Several other QTL were suggested. Taken together, these data indicate that the severity of the bpk renal cystic disease phenotype is modulated by multiple moderate QTL and possibly by epistatic interaction among them. It is intriguing that the suggestive QTL intervals on Chr 1 and Chr 4 have been identified in previous PKD experimental crosses. Both contain biologically relevant candidate genes. Our future studies will be directed toward exploring the biologic relevance of these modifier loci and their specific interactions in specially engineered strains. As a first step, we will generate consomic strains in which the entire chromosome carrying a putative QTL (CAST-derived Chr 6, CAST-derived Chr 4, and BALB/c-derived Chr 1) is introgressed into the BALB/c strain by serial backcrosses (16). In this way, the bpk locus and the QTL-containing chromosomes of interest may be isolated on a single genetic background, thus allowing their interactions to be more precisely studied. Once the consomic line has been characterized and the presence of a modifying effect is confirmed, it is then a relatively straightforward strategy to subdivide the consomic line into smaller congenic intervals and more precisely localize the QTL (intervals of ≤10 cM). Similar approaches have begun to provide pathophysiologic insights into complex processes such as insulin-dependent diabetes mellitus (36), systemic lupus erythematosus (37), colitis (38), and epilepsy (39), as well as in single-gene disorders such as the Min model of familial colon cancer (40). It is therefore exciting to speculate that by permitting the study of genetic variation at “rate-limiting” steps in lengthy and complex pathways, QTL mapping in mouse PKD models could provide unique tools for investigating the complicated biology of PKD, identifying genetic reagents for clinical prognostication, and ultimately, establishing the molecular platform for developing targeted therapeutic interventions. This work was supported by National Institutes of Health Grant DK51034 (to Dr. Guay-Woodford). The University of Alabama at Birmingham is fully accredited by the American Association for the Accreditation of Laboratory Animal Care. We thank W. J. Green and W. Collier for technical assistance. In addition, we thank Drs. E. D. Avner and D. R. Beier for helpful discussions.